Blue Mt. Lake from the Adirondack Museum. Photo courtesy Adirondack Museum. Larger than the state of Massachusetts, New York State’s Adirondack Park is unique in many respects besides it size. Almost half of its 6 million acres is publicly owned and protected “forever” wild forest land (called the “forest preserve”) under the state constitution. Approximately, 2 million acres is privately owned forest land available for sustainable commercial logging or development at 42 acres per building. The Park also has 103 villages and hamlets with an overall population of 130,000 residents. In the last half of the 19th century, the basis for the Park came from both romantic images of a region of rivers and lakes, wildlife, mountains and forests and problems from uncontrolled logging that led to forest fires and erosion threatening commerce on the rivers and lakes of the State. Romantics, conservationists and the business community, each in their own way, led the way to laws and ultimately a constitutional amendment to protect the Adirondack forests and a law to establish a park. The State Forest Commission had the initial responsibility for managing the public and private lands within a “blue line” in northern New York State declared to be the Adirondack Park. There were no guidelines within the law. 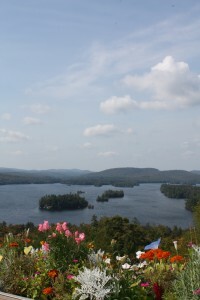 The Commission correctly forecast that one couldn’t “call the Adirondack park into existence by the touch of a wand.” One hundred years later in 1992, writer Eleanor F. Brown points out in her centennial article that the Adirondack Park is still undergoing the painful process of creation. During the Park’s first 80 years regulation in the Park was minimal. The State Conservation Department managed the forever wild forest preserve land within the blue line where the ability to cut down a tree was very limited. Ways were found for the State to establish and maintain hiking trails and relatively primitive camp grounds. Construction of damns and roadways in the Park occurred, but required publicly approved constitutional amendments to override the forever wild clause for specific projects. Land use in most of the private land within the Park was not regulated until the 1970s. Local governments were small and most did not have local zoning and planning laws. Development pressure was small and mostly concentrated in Lake Placid where there was a winter Olympics in the 1932 and 1980, Lake George and Old Forge. These areas became privately developed recreational destinations in a sea of forests, lakes and mountains that made up most of the Park. It was not until the late 1960s when a major highway, the Northway (I 87), was constructed on the eastern portion of the Park that development pressure including two proposed 20,000 acre second home developments in Park forced the State to establish land use regulations for the private land in the Park and establish a system for categorizing for management the public land in the Park. The state legislature established a state controlled regional land use agency, the Adirondack Park Agency, to administer density zoning and regulate regional development projects. The Agency also established guidelines for its sister state agency, the Department of Environmental Conservation (originally named the Conservation Department), and to manage the forest preserve lands. Park historian Ethan Carr describes the Park as encompassing portions representative of the three American conservation ideals: wilderness, renewable conservation and civic recreation. Almost 50% of the Park is constitutionally protected “forest preserve” including designated wilderness areas. About 40% of the Park is privately owned and may be used as managed forest land, a form of utilitarian conservation where the forest regenerates. In the remaining portion of the park one finds the civic ideal example of conservation with a variety of active recreational activities including skiing, hiking, swimming, snowmobiling, shopping on Main Streets, fishing and hunting. Writer Phil Terrie called the Adirondack Park a “contested landscape.” Battles have raged between environmentalists who work diligently to protect and expand the forest preserve land. Many local officials and property rights advocates argue that too much land has been set aside as forest preserve and local control has been lost. One bumper sticker, for example, declares “The Adirondack Park is not a Park, I live here”. To love the Adirondack Park is to not only to accept its many contradictions, but as is increasingly happening to seek common interests which transcend the competing differences inherent in the Park. B. McMartin, Perspectives on the Adirondacks: A Thirty-Year Struggle by People Protecting Their Treasure, Syracuse University Press, 2002. F. Graham, Jr., The Adirondack Park: A Political History, Alfred A. Knopf, 1978. W. Chapman White. Adirondack Country. Duell, Sloan & Pearce, New York 1954. P. Terrie, Contested Terrain: The Adirondack Museum, Syracuse University Press, 1997. P. Terrie, Forever Wild: A Cultural History of Wilderness in the Adirondacks, Syracuse University Press, 1994. Paul M. Bray has been an advocate for the Adirondack Park including as an attorney for Sierra Club in 1970s in proceedings opposing proposed second home developments in Park and as a former Trustee for the Association for the Protection of the Adirondacks. He was a bill drafter for the State Legislature, Counsel for the Adirondack Park Centennial Commission and was a policy advisor on smart growth in the Park for a former State Commissioner of Environmental Conservation. He also was the organizer of the twinning of the Adirondack Park with the Abruzzo National Park in Italy.